His students were all of the drummers who followed him and the scores of musicians who profited from his leadership and example. His inheritors are those of us who play or listen to modern American music. Here is a celebrated recording Roach by the 1950s quintet he co-led with trumpeter Clifford Brown. This is Brown’s composition “Joy Spring;” Roach, Brown, tenor saxophonist Harold Land, pianist Richie Powell and bassist George Morrow. 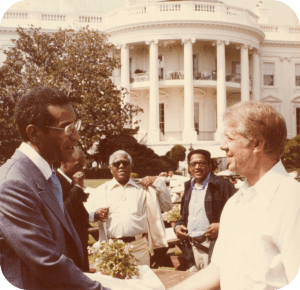 To visit the Library of Congress announcement about the acquisition of the Max Roach collection, go here. When I was writing notes for the reissue of Diz And Getz (Gillespie, Stan Getz, the Oscar Peterson Trio and Roach), I called Max, who was noted for his strong feelings about race and about jazz styles, to ask what he remembered about the session. “Stan Getz!” he said. “I never recorded with Stan Getz. Why would we record with him? He may also have not remembered that he was the drummer on Getz’s first recordings for Savoy in 1946. 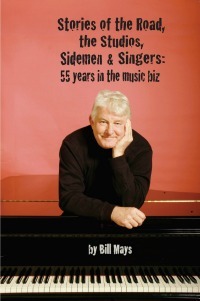 I have been enjoying the new book by pianist Bill Mays, a memoir of his half-century career in music. Written with panache and a fine sense of the absurd, it is packed with anecdotes about his experiences in jazz clubs and concert halls around the world and his extensive work in the movie and recording studios of Los Angeles and New York. There are stories about his encounters with artists and entertainers as various as Paul Anka, Barbara Streisand, Aretha Franklin, Placido Domingo and a raft of A-list jazz stars. Here’s a sample. For a Beatles “revisited” project I was hired by a Japanese producer to arrange and play on several Lennon/McCartney tunes. My trio recorded several tracks , and I arranged additional tracks using a string orchestra and alto saxophone added to my trio. The producer and I both agreed that “overdubbing” the great Phil Woods would add a lot to the music. Phil responded initially to the request for his services with, “That’s just what the world needs: another Beatles tribute. Count me out!” We cajoled, we pleaded, and he relented—and sounded absolutely marvelous. With Phil bringing his one-of-a-kind sound and his own personality to the music, the Beatles never sounded better! Mays writes about the time he severed the radial nerve in his left thumb in a kitchen accident. After surgery, his hand was in a cast for weeks. Some months earlier I had agreed to appear at a party and play some four-hands piano music with Harold Danko. I called and told him not to worry, that the cast would be coming off the week of the party, and that I could still make the gig. Ever the prankster, Harold asked me to bring the cast that the doctor had removed with a surgical saw. Conspiring before the performance, we put the cast back on my hand, with just enough Scotch tape to hold it in place. Harold made an elaborate announcement about how I had injured my hand, had had surgery, was still in a cast, but that we both had faith that my hand could be “made whole” for the evening’s performance. He brought me onstage, did a “laying on of hands” and in his best Jimmy Swaggart faith-healer voice, commanded, in the name of the Almighty, that I be healed and realize full restoration. With a shout and a rap of his fist, my cast flew off and across the room. Looking incredulous, I shook my hand, shouting “I’m healed, I’m healed!” Whereupon we sat down and played some outrageously righteous boogie-woogie piano together. Mays is donating proceeds from sales of his self-published memoir to the Musicians Assistance Program of the American Federation of Musicians, a fine cause. For information about how to obtain the book, see his website. 1. Alto saxophonist Grace Kelly was named one of Glamour Magazine’s top 10 college women for 2011. It takes some of us non-Glamour readers a while to get the word. Here’s Glamour’s video about Ms. Kelly. Sorry about the ads. They’re part of the package. Other Glamour top 10 college women include a scientist, a cycling champion, a nature protection advocate and a songwriter. To see the article about Ms. Kelly, go here. She and her quintet will be at the Portland Jazz Festival and at The Seasons in late February. I’m planning to report here on several festival events and the Kelly concert the same week at The Seasons. The quartet’s website, with a German-or-English language option, has information about the band’s origins, philosophy and recording history. The jazz winners did not appear on the telecast, but received their awards in a pre-broadcast ceremony out of sight of the millions who watched the main event. That is how NARAS, with rare exceptions, has buried jazz and classical music at the Grammy ceremonies for the past couple of decades. Music of substance and lasting value is available. Those who prefer it can seek it out, wishing all the while, perhaps, that musicians who devote their lives to perfecting their art and craft in jazz trios or string quartets or symphony orchestras could be rewarded with even a small percentage of the adoration and money lavished on obscene hip-hop performers or vocalists who specialize in bumps, grinds and pelvic thrusts. Maybe it’s just a phase we’re going through and modern equivalents of the big bands or the bossa nova or Frank Sinatra or the Brubeck Quartet or Miles Davis or whatever you miss most will come back to the Grammys. I’m an optimist, but I wouldn’t bet on it. 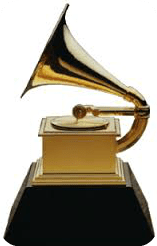 The Los Angeles Times has a complete list of Grammy winners. Doug, your comments about the Grammy’s reminded me of the recently published Google Music Timeline. In addition to the visual impact of the dramatic decline of the popularity of jazz in America since the early 1960’s, I’m struck by the changes to the types of jazz–click anywhere in the Jazz portion and you’ll see. Note that “classical” music is not included. Let’s also celebrate the three Grammy’s (Best Engineered Album, Classical; Best Classical Vocal Solo to Dawn Upshaw; Best Contemporary Classical Composition to Maria Scheider) awarded to Maria Schneider’s sublime Winter Morning Walks. Reviewed last April in this Rifftides post. Their gratifying wins are hereby acknowledged. Thanks, Larry. The “Pure Desmond” altoist has replicated Paul’s tone fairly accurately in the upper middle register, not so much in the lower tones and I did not hear any altissimo notes. Nevertheless, it’s really strange to hear something so close to Paul’s tone playing melodies so unlike his. Very strange… I’m afraid I just don’t get it. The news team for one of our local stations also covered the Grammys. A few of the evening gowns got high marks but the highlight of the evening was apparently a hat. Music wasn’t mentioned. Thanks to fellow Rifftides reader, Ken Dryden who emailed me earlier this week with two hilarious excerpts from jazz pianist Bill Mays book. Many years went by between the time I left L.A. and then reconnected with alto saxophonist Bud Shank. Then, in 2006 he was booked into New York’s Iridium jazz club for a week. It so happens I got an ear infection a few days before our opening night. It worsened, and the day of the gig I went to The Manhattan Eye, Ear and Throat Hospital. I was in pain and could hear only slightly in one ear. The receptionist, a beautiful, well-endowed young lady was questioning me and filling out forms. Upon learning my occupation, she said, “Jazz? Wow, I love it. Iridium? My favorite club.” I said, “Sounds like you must be a real jazz fan, am I right?” Without a word she reached her right hand over to the top of her sweater and pulled it down. On the upper third of her left breast she had a tattoo of an alto sax, complete with the keys, neck and mouthpiece. I think my ear cleared right up. I didn’t dare ask her if she had a tenor sax on the other one. That ends the posting of excerpts from the Mays book. We hope that readers will buy it and help struggling, ill and destitute musicians (No cheap gags about redundancy, please). See the original post above for a link. Funny. I haven’t heard the german puredesmond group before. The alto player is sound-wise much closer to early Bud Shank than to Paul Desmond. Apart from that: why try to copy Paul ? There is no use. If the group is playing good music I would be fully satisfied..
Just before Don Maggin died in 2012, he had finished a biography of Max Roach. that I think will be considered definitive. There have been delays in getting it published, but it’s hoped that can be accomplished this year. Don also did well received bios of Stan Getz and John Birks Gillespie.